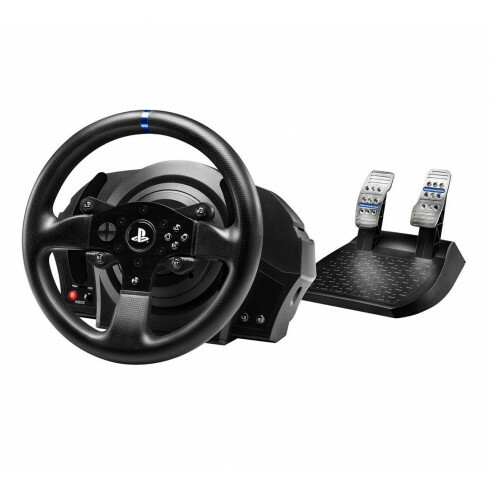 The Thrustmaster T300 RS Racing Wheel for PlayStation 3, PlayStation 4 and PC has a brushless industrial Force Feedback motor and extra buttons, which are used on the PlayStation DualShock 4 controller. The 11” steering wheel of this 1.2 kg heavy T300 RS is removable, thanks to the Thrustmaster Quick Release system. De rotation angle is adjustable from 270° to 1080°. The PlayStation 4 buttons “PS”, “Share” and “Options” are placed in the middle of the wheel. The two 13 cm sequential metal paddle shifters turn along with the wheel. The steering axis features H.E.A.R.T (HallEffect AccuRate Technology), incorporating a contactless magnetic sensor providing 16-bit resolution, for 65,536 values on the wheel’s steering. Overall it supplies one of the greatest feeling of virtual racing. It's easy to setup and straight forward to use. When buying a wheel, this has to be one to think about. Overall a fantastic wheel. I previously had a Logitech Driving Force GT which lasted well for three years. Obviously needed a new wheel, as an upgrade for the PlayStation 4. The wheel is very sturdy, attaches to my computer desk perfectly with the clamp system. The pedals are good, however I find the brake pedal quite stiff and no progression but a sizeable upgrade on the DFGT ones. The wheel is very quiet, nice to look at and very easy to install. Slightly expensive, but I say it's worth the money. Fast delivery also to where I am located in the UK. Completely changed the way I play driving games, my first steering wheel. The force feedback is fantastic, project cars and Gran Turismo 6 are completely different games. The pedals are ok, the brakes could do with being progressive but the actual wheel itself is fantastic. Everything about this product is just thrilling. The force feedback from the wheel is just great and thoroughly engaging. The pedals are standard but work an absolute treat. Best present for Christmas ever I my opinion. Very realistic steering, very happy with it. Good force feedback. Pedals no real resistance, they feel cheap. The T300 RS is a very good wheel. The force feedback is very realistic with Project Cars. The pedals can be improved with more feel, especially in the brake pedal, but there is still a lot of quality nevertheless. I definitely recommend this wheel. I bought this wheel to replace my Thrustmaster T500RS for use on the PS4. Fortunately with having the T500, I've been able to use my Pro Pedals, rather than the flimsy plastic pedals that come with the T300. Overall, the wheel and its force feedback work very well (basically the same as the T500) and the pro pedals are almost as good as my Fanatec Clubsport set, on my pc. The only problem I have with the T300RS, is every now and then it has a vibration in the wheel with a buzzing sound. It's happened a few times (which have been very annoying) and I can't think of any reason for it. I thought it might be from extended use in an evening, as it seemed to happen when I've been practicing/racing for a few hours, but last night it started after 30mins. If it continues, I will have to see about sending it back, as it's off putting when it's happening (it doesn't effect the wheels performance, it still turns and works), but it does take all the feedback away, or the vibration is just overpowering the feedback. Anyway, other than the issue above (which is probably just this wheel), the T300RS works excellently on the PS4 with Project Cars. A great wheel with okay pedals. The pedals are pretty basic, they work.. but that's about all there is to them. So, you might want to upgrade them sooner or later and that's why I'm giving it a lower score on Value for money. It would be nice if Thrustmaster had a true ecosystem where I could just pick the T300RS wheelbase with a Leather 28 GT wheel and T3PA pedals. Instead, I have to buy the full T300RS set and then buy all those upgrades, which is definitely more expensive. Being able to upgrade it over the years is still neat though. All in all, I have absolutely no regrets buying this wheel. It's a very nice product. I do recommend that you play racing SIMs, rather than arcade games. If you prefer to play arcade games you might be better off with something cheaper because in those games the FFB is rather basic. This wheel driving experience of you a real car, it looks really good. Playseat doesnt need any review.It is the best playseat ever. I suggest many if my friends to buy playseat and we all brought it. Playseat had made a seat which a gamer needs. The size the comfort the quality is the best. Very well built and has all the features you need to feel like a pro driver. Bit costly but you get what you pay for and I got when PS4 was still new. You will have to fight wheel tension to complete the turn very realistic.the only drawback is for all it's quality feel for the price it does not transcend to the plasticky and slippery pedals which is a shame for all the fun I am having. The only force feedback wheel on the market for PS4. Expensive but very good quality. The pedals are OK but I upgraded to the thrustmaster T3PA pedals for the clutch. Also bought the thrustmaster Ferrari F1 Add-On Wheel which can be changed fairly easy. Fits perfect on my gaming Chair. Overall a good quality wheel with excellent and quiet feedback. This is the first wheel i own. It took me quite some time to read and view reviews before i made up my mind. In my opinion it is worth almost every penny. The feedback is great, the quality is great and i had no problems with games supporting it. I have to admit i only played dirt 3 and gran turismo on ps3. The only thing that they should have done a little better is the pedals. They seem a little entry level compared to the wheel. Also, the brake pedal does not have progressive resistance. But i knew all this from the reviews.